A How-To video series about how to be a motivational speaker. 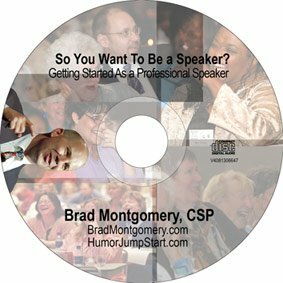 In this very informal video in which Brad Montgomery — a funny motivational speaker — Brad asks fellow motivational speaker and Colorado speaker Elaine Dumler for a killer tip for folks on their way to being a paid professional speaker. She offers up some excellent advice about being yourself on the platform — something that is very hard to do, but is crucial for your success as a speaker. More interested in reading than going to YouTube? We’ve got your back! Check out this transcription…. 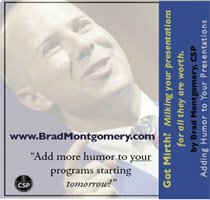 Brad Montgomery: Hi, this is Brad Montgomery from bradmontgomery.com with the continuing series on how to be a motivational speaker. As I said before, I don’t know – I don’t have all the expertise, but I know people who do and we’re looking at ****my pal, Elaine Dumler. Elaine Dumler is a college speaker who speaks nationally to everybody, but specializes in military audiences and today she’s going to tell us at least one tip about how to be a motivational speaker. Go Elaine! Elaine Dumler: I think the best thing that you have to always remember to do when you’re speaking, especially if you’re working to motivate other people, is you’ve got to be real. I think a lot of times we see speakers on the platform who are not the same person as they are maybe off having a beer, a cup of coffee or something. You have to be who you are. You want that type of connection and rapport that comes from just being your true self on the platform and letting you come out in everything that you do. I think that’s what makes you someone that someone wants to listen to. And if you’re going to add humor, and kind of make it funny, or you know, work kind of natural humor into it, it has to come from who you are. And if it doesn’t come from your heart, then I don’t know where it’s coming from. Brad Montgomery: I think – thank you, Elaine – being you is important. That’s why when I’m a motivational speaker, I always strive to be Elaine Dumler. All right. More tips on how to be a motivational speaker. Stay tuned. Thanks, Elaine.